Designer Japan Golf Promotion Inc. This is the second oldest golf course in China. The Japan Golf Promotion Inc. has designed it so it looks as if were a Japanese flat course. 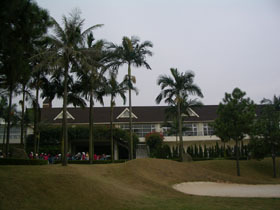 The course is not only flat but also all the holes are straight except for Hole 17 and 18. Hazards off the tee seldom come into play, and approach shots from off the greens are relatively easy, so the course is not difficult. However the separation of all hoes by matured trees is wonderful. The course is preferred by players who like to have a good score by hitting shots in an easy pleasant way or who want to enjoy a Japanese course flavor. OBs come into play on both sides of the relatively narrow fairway. Also from the tee you need to avoid 2 big trees in the center of the fairway. The second shot is slightly uphill. A long par 5 with OB on the left. The tee shot needs to be over water and if you slice it too much the ball will catch in a long bunker in the lake on the right side of the fairway. Downhill with the narrow fairway. A pond bordering the front right of the green increases difficulty level. The green is big and double-tiered. An excellent par 3. Strategically placed deep bunkers protect the slightly elevated green on both sides. A gentle dogleg around a lake on the left. Bunkers on both sides of the fairway come into play from the tee. The second shot is slightly uphill. A fairway wood off the tee can be a good strategy for this slightly uphill dogleg to the right, If you hit too far left beyond trees protecting the left side of the fairway you will be OB. If you hit too far right you might find your ball in trees with no direct line to the green. The key to success on this hole is accuracy of the tee with the right club selection. The green is elevated and the view to the green and its surrounding area is beautiful. It takes 1 hour 10 minutes from Hong Kong to Zuhai by ferry and then 20 minutes from the Zuhai ferry terminal to the club by bus. It takes 40 minutes by taxi from the China-Macau Border. Zuhai GC is the course where Zhang Lianwei, the first and currently the best pro in China was introduced to golf. The oldest course in China is Chung Shan Hot Spring (中山溫泉) GC - Arnold Palmer Course opened 1 year earlier in 1984 than Zuhai. Japan Golf Promotion Inc. has designed several courses including Onomichi GC in Japan. Bangpra International GC in Thailand is famous for its oversee design.